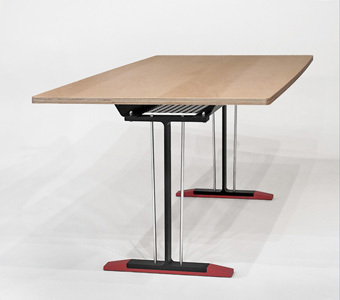 The City Desk is supported by the same trestle frame as our Partners Tables, a version of our stabilized beam design. Brackets bolt the desktop directly to the steel stretchers of the trestle assembly. The result is a lighter desk with a high proportional core weight. The lower beam flanges of the trestle legs lock into milled aluminum floor supports. These aluminum 'shoes' are available in black or red. Width 36" Length 62" Height 29"